Sunshine Autos, also known as the Sun Yard or the Car Showroom simply, is a car showroom in Vice City featured in Grand Theft Auto: Vice City and its prequel, Grand Theft Auto: Vice City Stories. In both games, Sunshine Autos is located just south of Little Havana on a patch of underdeveloped land. 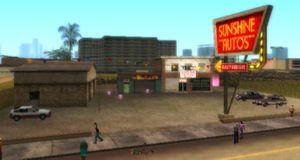 Exterior of the "new" Sunshine Autos in GTA Vice City. In GTA Vice City, set in 1986, the business is based in a solitary modern two-storey showroom which more or less serves as a front for a vehicle theft ring for BJ Smith's "BJ's Used Autos" (where stolen vehicles are passed off as used cars for sale); during the player's purchase of the showroom, BJ points out Sunshine Autos was his first investment after he turned pro in his football career, but BJ had borrowed a lot of money from the city's loan sharks and wished to make some quick cash to get out of town with. He mentioned to Tommy that he could, "burn the place down if I wanted to", as the dealership was situated on prime development land. The showroom becomes available for purchase for $50,000 after "Shakedown", when the player unlocks the ability to purchase various businesses in the city. Once purchased, the player will not only have access to the vehicle theft sidequest at A+B Auto, but will also be allowed to participate in a set of street races, as well as utilize the showroom's four garages that are capable of storing up eight road vehicles (Each garage is capable of holding two vehicles, but can only support up to specific models of mid-size trucks, including the Mule, Spand Express and Benson; the Yankee, Packer, Coach or Bus cannot be stored in the garages). The showroom also comes equipped with the only Spray'n'go spray shop in town, which can be accessed at any point of time in the game. The "old" Sunshine Autos in GTA Vice City Stories. Sunshine Autos circa 1984 in GTA Vice City Stories is originally a two-building, open-air used car dealership based further north (in front of the Little Havana-Escobar International Airport shortcut, which does not exist in GTA Vice City); during events in GTA Vice City Stories, the old showroom exists in tandem to the construction site of the "new" Sunshine Autos a short walk south, which is surrounded by a trailer park where Trailer Park Mafia reside. It is implied that the old dealership was completely cleared away after the completion of the new showroom between events in GTA Vice City Stories and GTA Vice City. The dealership is primarily used by the player to purchase various vehicles, and hosts a series of Turismo races, which can be accessed from the side of the main building. Once all the listed cars are delivered to A+B Auto's Sunshine Autos Import Garage in GTA Vice City, the Deluxo, Sabre Turbo, Sandking and Hotring Racer cars start spawning inside. Also before these cars start to spawn, a Sentinel can be found inside. Much like Wang Cars in GTA San Andreas, the Sunshine Autos' showroom in GTA Vice City is an ideal defensive position that allows the player to survive for extended periods of time while on high wanted levels, offering the best chance to acquire otherwise hard-to-obtain law enforcement vehicles (like the FBI Rancher or Rhino). The two-floor design of the showroom, coupled with poor pathfinding of NPC AI, results in hostile law enforcements NPCs being unable to reach the player if the player is holed up on the second floor; in addition, police helicopters will not pursue the player if the player hides within the confines of the showroom. The showroom's built-in spray shop also makes for escapes from the law far easier. Logo of BJ Smith Used Autos, the former name of the business in GTA Vice City. Tommy Vercetti buying Sunshine Autos from BJ Smith in GTA Vice City. Sunshine Autos' sub-level garages and side-mission facilities in GTA Vice City. Construction site of the "new" Sunshine Autos in GTA Vice City Stories. This page was last modified on 15 March 2017, at 15:45.